Seuls les établissements avec des commentaires sur les 12 derniers mois reçoivent une note. 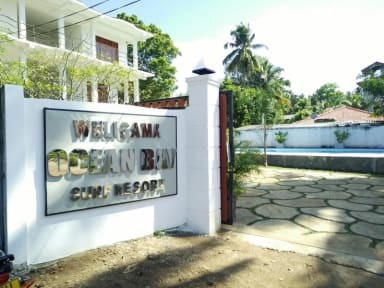 Hello and welcome to Ocean Bay Surf Hotel, Weligama. 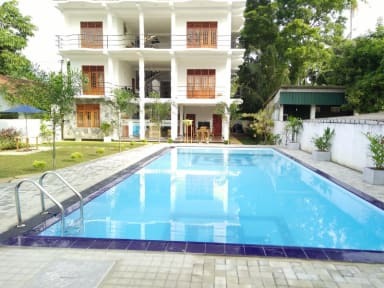 A luxury but affordable surf hotels situated 30 seconds stroll to Weligama beach. We offer a safe and clean environment for guests from around the world to meet new friends, share stories and relax in our swimming pool under the palm trees sipping fresh coconuts after a long day surfing. Our aim is to provide you with a true sense of well being. All-star spa, and world-class Sri Lankan cuisine. Let us help you create the perfect yoga, surf, and wellness. Our staff will be on hand to ensure your stay is just the way you want it to be and can offer you island wide tours and activities. Just esquire at reception for more details. 2. Check in from 12:00 noon to 23:00. 4. Payment upon arrival by cash and Card. 5. Breakfast not included in price and can order separately. 6. No Smoking in rooms.